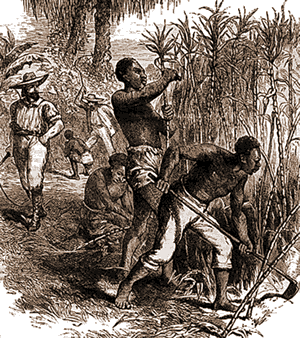 Demand for slaves to cultivate sugarcane and other crops caused what came to be known as the triangle trade. Ships leaving Europe first stopped in Africa where they traded weapons, ammunition, metal, liquor, and cloth for captives taken in wars or raids. The ships then traveled to America, where slaves were exchanged for sugar, rum, salt, and other island products. The ships returned home loaded with products popular with the European people, and ready to begin their journey again. An estimated 8 to 15 million Africans reached the Americas from the 16th through the 19th century. Only the youngest and healthiest people were taken for what was called the middle passage of the triangle trade, partly because they would be worth more in America, and partly because they were the most likely to reach their destination alive. Conditions aboard the ship were dreadful. Slaves were jammed into the hull; chained to one another in order to stop revolts; as many as one in five passengers did not survive the journey. When one of the enslaved people was stricken with dysentery or smallpox, they were cast overboard. Those who survived the middle passage faced more abuses on the plantations. Many of the plantation owners had returned to Europe, leaving their holdings in America to be managed by overseers who were often unstable or unsavory. Families were split up, and the Africans were not allowed to learn to read or write. African men, women, and children were forced to work with little to eat or drink. The African slave population quickly began to outnumber the Europeans and Native Americans. The proportion of slaves ranged from about one third in Cuba to more than ninety percent in many of the islands. Slave rebellions were common. As slave rebellions became more frequent, European investors lost money. The costs of maintaining slavery grew higher when the European governments sent in armed forces to quell the revolts. Slaves forced to work in the field. 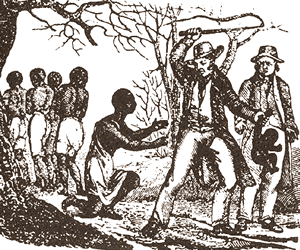 Many Europeans began to pressure their governments to abolish slavery. The first organized opposition to slavery came in 1724 from the Quakers, a Christian sect also known as the Society of Friends. Great Britain outlawed slavery in all of their territories in 1833, but the practice continued for almost fifty years on some of the islands of the Caribbean. Once slavery was abolished, the plantation owners hired hundreds of thousands of people from India and other places in Asia. In Trinidad, about forty percent of the population is Asian. 1659 – Queen Elizabeth I declared, “England was too pure an air for slaves to breathe in.” English law decreed “as soon as a man puts foot on English ground, he is free," yet slavery in British held land in American continued for 238 years. 1774 – Rhode Island became the first of the American colonies to abolish slavery. 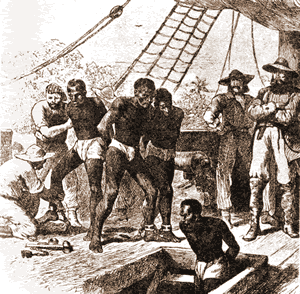 1807 – The United States forbade the importation of new African slaves. 1807 – The British abolished the slave trade in all of their colonies. 1823 – Slavery abolished in Chile. 1829 – Slavery abolished in Mexico. 1854 – Slavery abolished in Peru. 1865 – The fourteenth amendment to the United States Constitution declared that neither slavery nor involuntary servitude, except for punishment for crime shall exist within the United States. 1873 – Slavery abolished in Puerto Rico. 1880 – Slavery abolished in Cuba. 1888 – Slavery abolished in Brazil. 1962 – Slavery abolished in Saudi Arabia.